Volunteers support NHS staff as they deliver the incredible care they’ve been trained for. Mother of two JENNI PEACH, 49, an insurance account executive from Romsey in Hampshire, started volunteering a year ago as a mobility assistant at Southampton General Hospital, helping elderly and dementia patients. I love volunteering so much I call it my ‘me time’. And my teenagers are so impressed with what I do that my daughter, who’s 14, asked to do her recent work experience at the hospital. Twice a month, I spend three to four hours as a mobility assistant to elderly and dementia patients – trying to keep them physically active and socialised. Although I work full time and my husband and family are very busy, I wanted to volunteer to help ease the workload for doctors and nurses. I’m from South Africa, where the state health system is so bad the bad hospitals cannot cope: years ago I rushed a friend to A&E after she attempted suicide – she had internal injuries but we had to sit in the emergency department with her on a drip for four days before a bed became free. So I know what can happen to a free health care system under strain and don’t want it happening here. Right from the start, I felt like a much-needed member of a dedicated team – the training the volunteers receive shows just how seriously they view what we do. I spent one Saturday with physiotherapists who showed us how to help patients stand, walk and raise themselves from a chair while minimising the risk of falling. Another Saturday I moved onto learning how to encourage older people, particularly dementia patients, to eat. My final training was in ‘Time for Me’, encouraging elderly patients to talk to volunteers and share information which often they won’t tell a doctor or a nurse because they don’t want to be a burden. One elderly patient told me they were afraid when the lights went out at night – which the nursing staff hadn’t realised. As a result, they put the sidelight on at night and the patient was able to finally have much-needed sleep. Having conversations with elderly patients is also essential as so many are lonely. It is such a positive feeling, knowing you’ve made a difference. 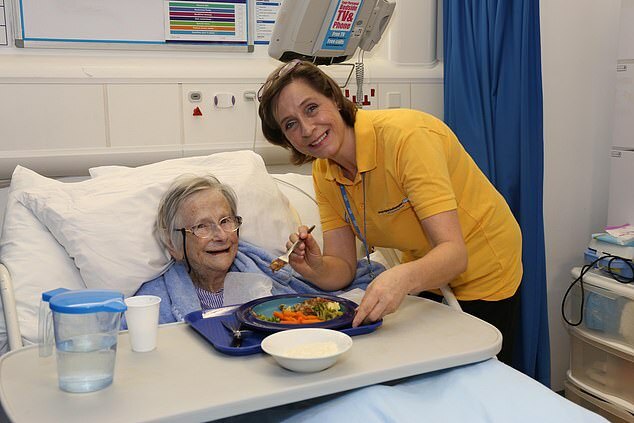 Feeding one patient with dementia can take 45 minutes, but me doing that allows a nurse to feed a complex patient who can no longer swallow – we’re not allowed to help patients at risk from choking. I’m grateful for everything I have gained from this exhilarating and varied experience – I’m looking forward to retirement so I can increase my hours of volunteering. My day job pays the bills, but volunteering brings the satisfaction and achievement to my life. 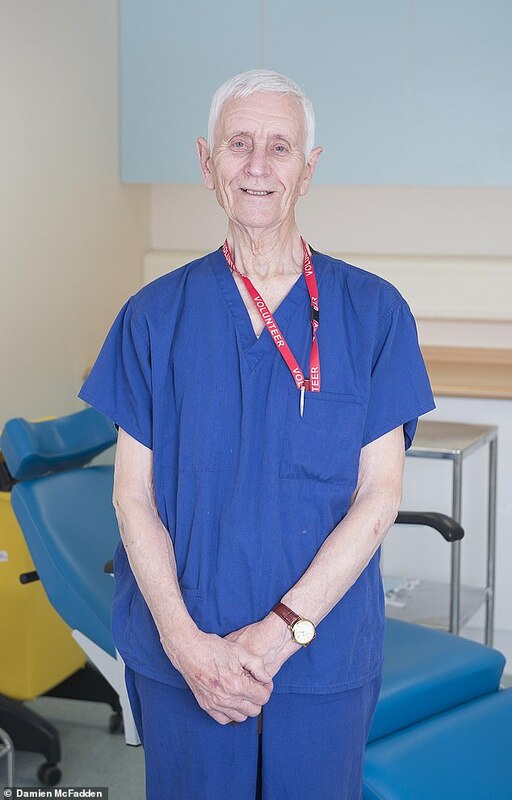 Ex-security superintendent RON KNIGHT, 87, has volunteered at an eye injection clinic at West Suffolk Hospital near his home in Bury St Edmunds for ten years. My wife Betty and I had been married 52 years when she died – for me her passing was a very sad loss. She had Alzheimer’s and I had nursed her at home for five years before she died. Suddenly I had no purpose. I found out about volunteering when I went to visit a friend in hospital and saw a booklet about it. Volunteering changed my life and helped me focus on something other than grieving. Lots refer to me as ‘the kind man’, which is lovely. Essentially that’s my role – to show kindness. I go to the waiting area and collect the patients’ notes and call them through. That’s when my job really starts – making patients feel at ease as I take them into the clinic. Our patients mainly have the eye condition age-related macular degeneration. They come to have injections of a drug into their eye to halt the condition’s progress. Having a needle in the eye isn’t a nice prospect. I wouldn’t fancy it. My job is to soothe and reassure them so that they are calm when they have the injection – which is better for them and for the doctor giving it. I talk to patients about anything to put them at ease. The more they can relate to me the more they relax and I have a lot of life experience to draw on: I’ll discuss anything from football to what a lovely colour coat a lady is wearing. When patients have the injection, I hold their hand if they are female, and put my arm round their shoulders if male, and tell them to keep staring at my hand. Putting them at ease helps the doctor and nurses concentrate on what they have to do – and that ensures the medical treatment gets done quicker. At the conclusion of my shift the doctor and nurse on duty always thank me for my input. It’s nice to be valued, and be part of a team. You can really build a relationship with patients. Some send me Christmas cards and when I was admitted to hospital two years ago with pneumonia, many who I know through volunteering visited me – as did some doctors and nurses from the clinic. It did wonders for my morale. Volunteering has been such a Godsend. In 2014 I lost my beloved grandson Graham in a climbing accident and my daughter Alison, his mother, died soon after. Had it not been for my volunteering I don’t think I would have coped as well as I did. Every day I’m at hospital, I leave on a high. Betty was a nurse and I know she would appreciate what I do. I just hope I can carry on doing it for another ten years. 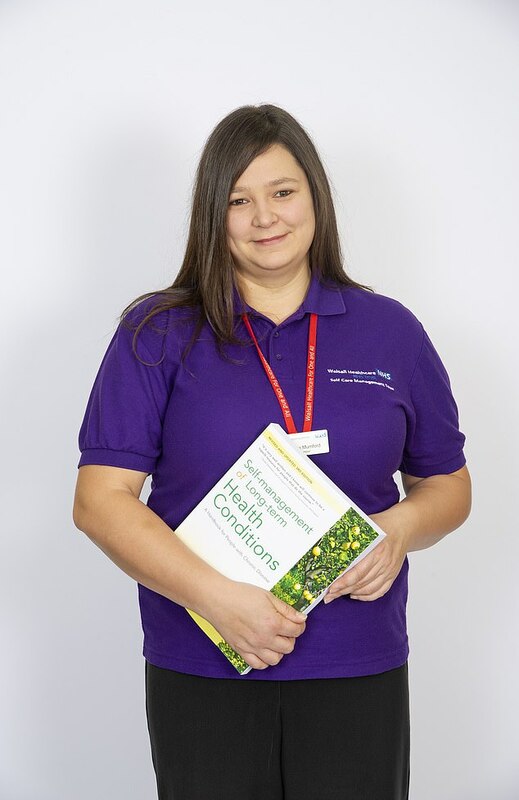 COLETTE MUMFORD, 32, a former nursery nurse, has volunteered for the past seven years at the Walsall Healthcare NHS Trust in the West Midlands, running weekly courses helping other patients, like herself, manage their long-term conditions. I see myself in everyone who walks through the door – they’re all in physical or mental pain and vulnerable, like I was. When I was 23, I developed arthritis and could only walk with sticks. I couldn’t leave my home without help and felt isolated. Then mum found out about the self-care management programme at Walsall and signed me up. It’s for people with long-term health conditions, to show them how to manage symptoms and stresses and to prevent things getting worse. Within a month, the coping mechanisms I was taught started to make a real difference – small things, like taking a walk to release feel-good endorphins. I couldn’t walk far because of pain, but I learned distraction techniques, and my confidence grew. After finishing the course, I was asked if I would train to be a tutor. I really couldn’t believe they were asking me, but the tutor said I’d done so well I could share my knowledge. I was terrified, but I thought ‘I will stop feeling like a burden on people and feel like I can actually help’. I volunteer for two-and-a-half hours a week, everywhere from community centres to doctor’s surgeries and churches, with up to 24 people in each session – last year I helped about 242 people, aged 18 to 107, suffering from conditions ranging from chronic lung disease to arthritis. It can be simple things. One patient wasn’t physically able to make her porridge. In our group discussion, we suggested she microwave the oats. She hadn’t realised that was possible – and it had a life-changing effect. To help others and change their lives has given me a huge boost. I still can’t walk far, but rather than be a recluse, volunteering has restored my confidence enough for me now to go back into the workplace. HELPING OUT? IT KEEPS ME YOUNG! 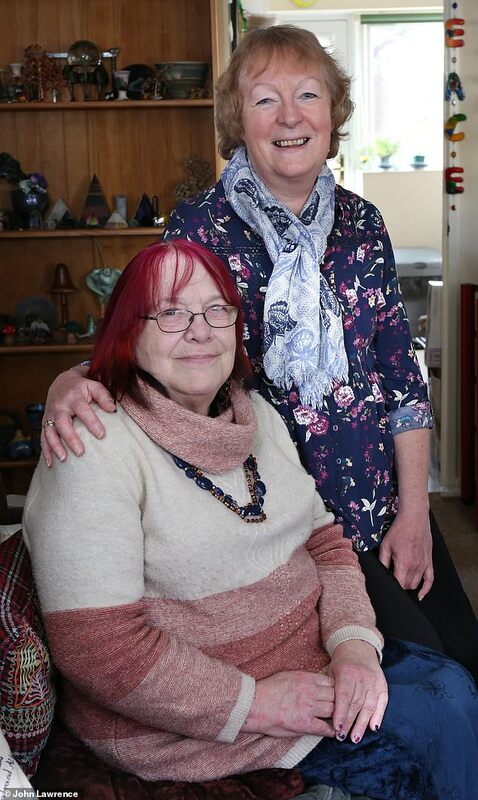 BERYL ARMSTRONG, 71, who lives alone, suffers from multiple health problems leaving her permanently breathless and in constant pain with limited mobility. Last year the retired housing officer came under the wing of volunteer CAROLE SUMMERFIELD, 67, a former civil servant from Taunton. 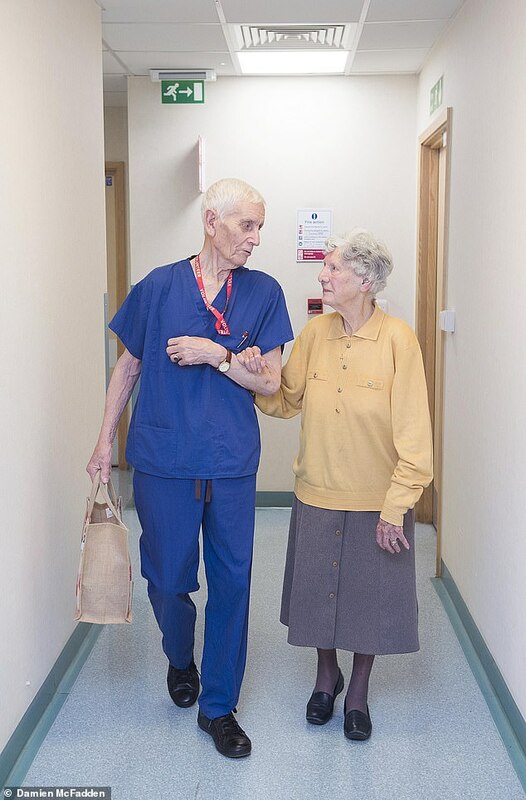 Beryl says: Last year I had my third emergency admission to hospital in the space of six months, and when I was discharged I was in a bad way. I was only just able to walk around my bungalow and didn’t know how I was going to get to the shops. Even for an optimist, I was at a pretty low point: pain does wear you down. I’d just arrived back at my bungalow when Carole, the Red Cross volunteer, rang. As soon as I heard her friendly, reassuring voice, I knew I didn’t have to worry any more. She drove me to the supermarket and pushed the trolley while I leant on it for support. I’d never have been able to push a trolley alone or lift any bags. Back at home, I had to sit on my sofa to peel the vegetables because I was in too much pain – so Carole brought me a perching chair, so I could sit high at the kitchen bench. I was so happy because cooking is my favourite thing. It’s how I relax and forget about my health problems. I so enjoyed Carole’s company, because I live alone and I couldn’t get out to see my friends. Her smiling face and positive presence makes recovery so much easier – and I’ll forever be grateful for that. Carole says: Beryl is just 5ft 3ins but blessed with a wonderful feisty spirit. But when she came home from hospital, she was finding it difficult. I quickly realised that she loved cooking and her supermarket shop was really important to her. It wasn’t about getting the basic foodstuff to survive – Beryl had a long list of ingredients and herbs and spices – and it was wonderful to watch the difference in her when she was able to do something she loved. I spend two to three hours with each person on my list, seeing up to three people a week. Many have lost their confidence and independence – they’re all older people and many live alone, so they can become lonely. Quite a few tell me the same stories over and over again because they’ve nothing new to tell as they can’t leave their home. But I smile and listen and make cups of tea and chat, and you can see the difference in their eyes that the company makes. At 67, I’m not much younger than some of those I help. But being a volunteer keeps me young – I’m convinced of it. If you own a dog, play an instrument, ride a motorbike or simply have time on your hands, you could take some of the strain off frontline NHS staff. 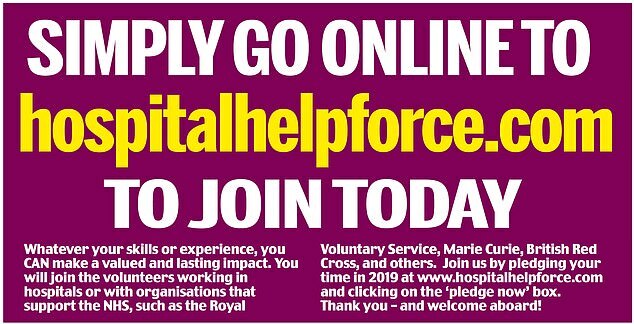 By volunteering for a series of mostly unskilled jobs – if only for a few hours a month – you’d be making a huge difference. Depending on your circumstances and what your local hospital needs, you may even be asked to carry out more than one duty.